For your viewing pleasure, three films ripped from the Erie Reader Queue. Thank you, Netflix Recommendations section, for without which I would have never given this unorthodox cartoon any serious thought. 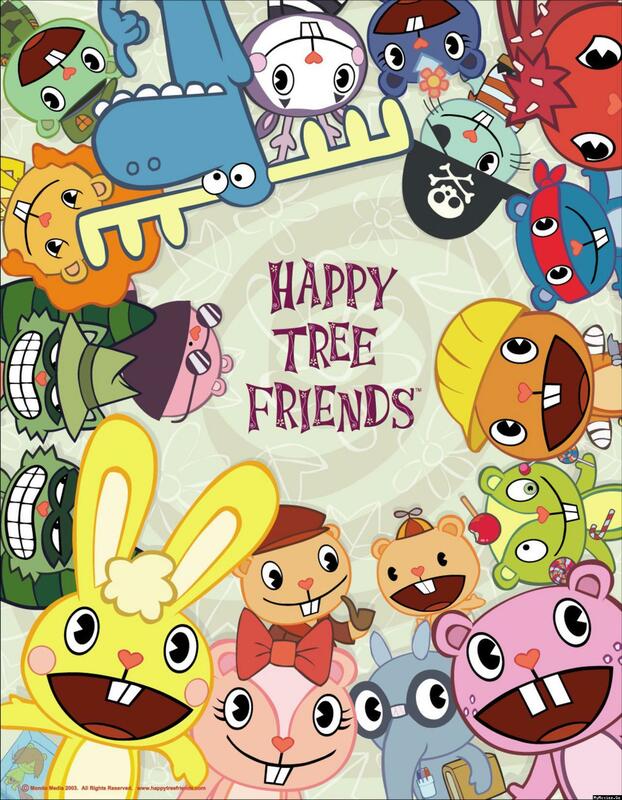 Designed to look like any random Nick Jr. program, "Happy Tree Friends," on the surface, is about the adventures of cute and cuddly critters like Cuddles the bunny, Disco Bear, and Giggles the chipmunk. However, that's where the G-rating ends as each episode features the creatures meeting grisly, graphic, and often funny demises. The juxtaposition of the look and feel of the characters with the actual content of each cartoon makes this sublimely ridiculous and highly entertaining to the point where I quickly burned off the entire 13-episode run in two evenings. Each 7-minute cartoon is made all the funnier by being capped off with an old lesson or moral you'd recognize from nursery rhymes and fables that somehow tie-in to the carnage we just witnessed ("Be careful what you wish for" and "A chain is only as strong as its weakest link," for examples). Of all the discoveries I've made on Netflix, this is the first I feel deserves a perfect score. I often have a love/hate relationship with Will Ferrell movies (loved "Anchorman," hated "Talladega Nights," didn't bother with "Kicking and Screaming"), but I find he is severely underrated in quirky dramedies that ask of him to summon the everyman charm that made him a success early in his "SNL" career, rather than having him rely on acting like a man-child. The best example of this is Harold Crick, a man whose life, and imminent death, is being narrated by an author unknowingly writing his story, in the fantastic "Stranger Than Fiction." So I had high expectations of getting something closer to Crick than Ron Burgundy when I watched "Everything Must Go." Here, Ferrell is Nick Halsey, an alcoholic who in the course of one day loses his job and his wife, who has strewn his belongings on the front yard of their home and changed the locks. After spending the night al fresco, where we see some serious self-wallowing, Halsey decides to sell everything in an attempt to purge himself of his old life. What follows is a look into the dynamics of human relationships and their importance in persevering through times of doubt and rebuilding. The film does tend to come off like a paint-by-numbers indie flick, right down to the open ending, but it is always refreshing to see Ferrell step out of his comfort zone, particularly with a character as dark and troubled as Halsey. I was a little behind in joining the smart phone revolution, and even after I finally caved, I told myself I would not be someone who downloads apps for the sake of downloading apps (seriously, does anyone really need a bullhorn on their phone?). But one guilty pleasure I cannot escape is Words with Friends. My obsession with Words is what led me to watch "Word Wars," which isn't about the mobile game but about several "word nerds" as they prepare for a national Scrabble tournament. "Wars" provides a great look at the cultural and sociological impact of this seminal word game as we meet four players from all different walks of life competing for the top spot. The documentary also peppers in some fascinating history of the game (like how the decision to ban offensive words came into play) and acts as a pseudo-strategy guide for obtaining 7-letter-plus words. I loved how the doc was actually able to build tension as we progressed into the national finals, but most surprisingly was just how stylishly produced this film was – we are even treated to a very poignant use of the Beatles' "Across the Universe" that adds heavily to this story. All titles are currently available for instant streaming on Netflix. For your viewing pleasure: a comedy, a drama, and a documentary -- all available for instant streaming on Netflix and instant reviewing here at Erie Reader. For your viewing pleasure, three critically-acclaimed classics ripped from the Erie Reader Queue. Three movies streaming on Netflix reviewed for your reading pleasure. "Following," "Super High Me," and "Code Monkeys"--all streaming on Netflix and reviewed here for you. And now for your viewing pleasure, three films reviewed. Eerie Horror Fest and Expo President Greg Ropp brings the ?Boondock Saints? to Erie for this year?s fest.